SpendEdge, a global procurement market intelligence firm, has announced the release of their Global Mobile Wallet Services Category - Procurement Market Intelligence Report. The mobile wallet services category credits a significant share of its accelerating spend momentum to the exponential growth of the e-commerce industry. This industry accounts for extensive usage of mobile payment methods that ease the payment process for customers. Emergence of the high-speed cellular network is boosting the usability of mobile payment which will consequently, propel the demand for mobile wallet services across the significant economies during the forecast period. Download the free sample of this mobile wallet services market intelligence report here! Availability of an array of deals, discounts, and rewards is luring millennials in the US towards using mobile wallet services to make payments at e-commerce and retail stores. Convenience in payment is resulting in faster adoption of contactless payments across most of the retail stores which are consequently spurring the demand for mobile wallet services in the US. Government-led initiatives to foster a cashless economy coupled with digitization will pave the way for an impressive spend growth of the mobile wallet services in APAC. Meanwhile, in Europe, smartphone users are significantly contributing to the growth of the category. This mobile wallet services market intelligence report offers a detailed overview of the key cost drivers and category management insights that can aid in devising a sustainable procurement strategy. This mobile wallet services procurement research report also highlights the current supply market developments to help the buyers choose the appropriate vendors who can promise a steady supply assurance along with quality solutions. Not what you are looking for? Request for personalization of this mobile wallet services market intelligence report. “The quantity and quality of partnership of a prospective supplier with banks, financial institutions, and payment gateway service providers do not only testify the nature of the services delivered but also assure on the supplier’s adherence to financial regulations,” says SpendEdge procurement expert Anil Seth. 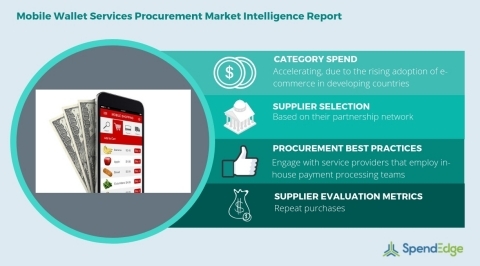 SpendEdge’s procurement market intelligence reports for the financial services category offer information on critical cost drivers and category pricing strategies to help the buyers achieve significant cost-savings. The supply market forecasts offer information on supplier performance benchmarking criteria to help buyers reduce spend and establish better SLAs. Additionally, SpendEdge’s reports offer category management insights and procurement best practices for the category. Do you purchase multiple reports in a year? Our subscription platform, SpendEdge Insights, provides ready-to-use procurement research reports for numerous categories. Now access latest supplier news, innovation landscape, markets insights, supplier tracking, and much more at the click of a button. Start your 7-day FREE trial now.